We were given a free copy of this book in exchange for our honest review. All opinions are my own. 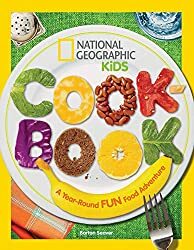 Today’s giveaway is for a copy of National Geographic Kids Cookbook: A Year-Round Fun Food Adventure. This is a fun cookbook! This cookbook takes you through the year and has recipe ideas based on the events going on in each month. It has tips for healthy eating and food facts as well. My kids love to cook and were very excited to find this book at our home. I like that it has ideas for foods that are kid-friendly to make. Today I am giving away two copies of this book, so there will be two winners! Enter below. You must fulfill the rules of each entry for each entry to count. If I see the entry is not valid (did not meet entry requirements), I will disqualify your entry. Trust me, I check each winning entry to make sure it was valid. Entries will be accepted until 12:00 midnight October 31, 2014. My daughter just turned two so we haven't actually cooked anything together. She loves to cook "yogurt" in her play kitchen 😉 I remember baking cookies with my grandmother a lot so I'd love to do that with Shelby soon! My daughter is too young to cook with me yet but I'm always looking for fun and delicious kid friendly meals for lunch. I would love to have this book to use myself now and with my daughter later. I love to make English muffin pizzas with my 2 year old! My 9-month old loves to watch! This looks like fun! I need all the help I can get in the kitchen! Oops! I forgot to say that our favorite thing to cook in the kitchen together is pasta! I love to cook with my son! His favorite thing to cook with me is cookies, though he loves to help with dinner anytime I let him..
My daughter loves stirring and putting liners in a muffin pan so making muffins (or other baking) is her favorite. We like to make breakfast food. Like eggs and pancakes! My kids love to help with smoothies (putting ingredients into the blender), and also any baking…breads/cookies/muffins. Thank you! We like to make green eggs and toast!